When we go out to eat, it is usually to enjoy a meal that we would not prepare at home. We love the food we make at home, so don’t go out very often. There are a few restaurants on Maui where we look forward to dining, and we visited one of them tonight. 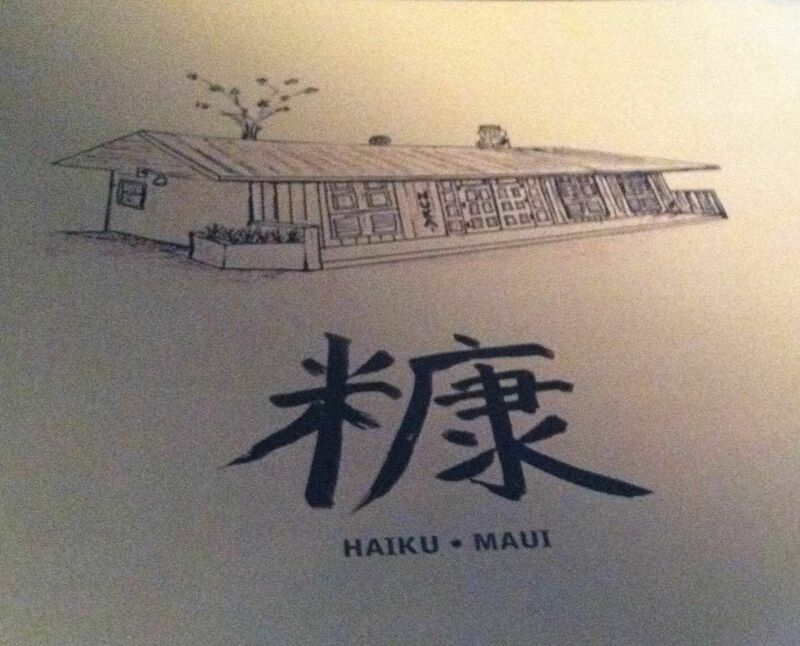 It is relatively new, opening on March 22, 2013, and is located in Haiku. 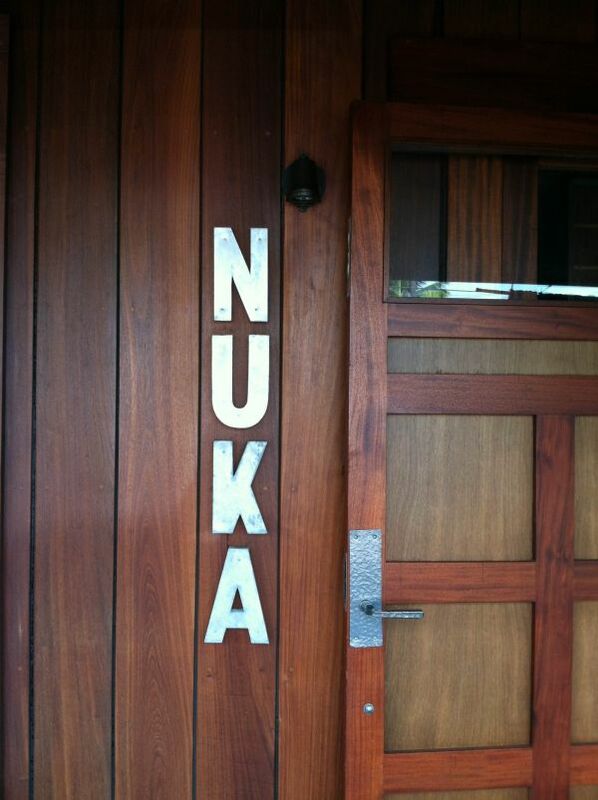 This gem of a restaurant is called Nuka, and we love it. We have eaten at Nuka about 8 times now, and have not been disappointed once. The owners did a beautiful job of designing a space that is visually beautiful and comfortable for our dining pleasure. From the Venetian plaster walls to the artwork to the stunning bathrooms, Nuka just feels good. The servers are attentive and helpful if you are looking for a recommendation, or need help making up your mind. And let’s not forget the food, which is amazing. The food is delicious and exquisitely presented. Before I tell you what we ate, I should say something about the way we like to order our food. When we go out for a nice meal, we never order everything at once. When all the food comes out at more or less the same time, your dining experience can be quicker than it should be. We like to order one thing, and while we enjoy our first dish, we ponder over the menu and decide what to order next. Doing this allows us to have a leisurely dinner, rather than a quick one. Now, on to the food! 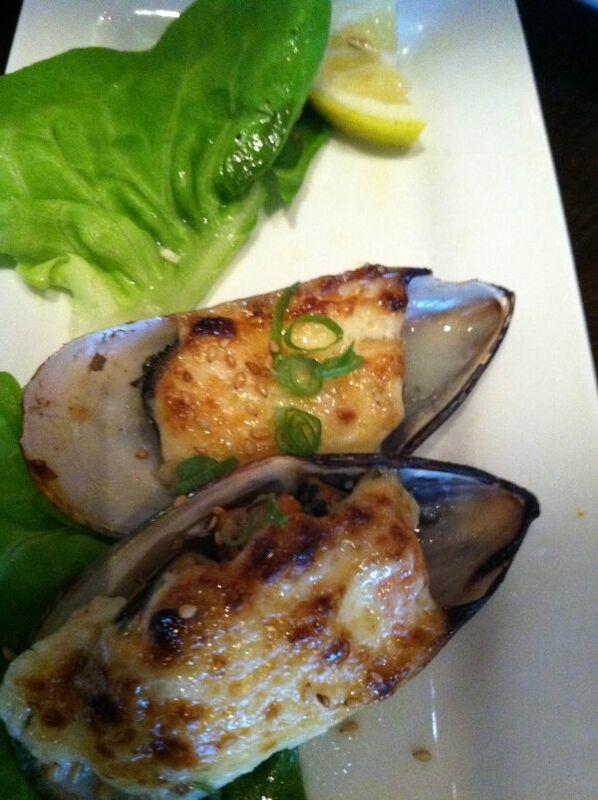 We started with one of our favorite dishes, Baked Mussels in Dynamite Sauce. I have no idea what is in Dynamite Sauce, but the name is certainly apropos; it is a dynamite sauce. The mussels were cooked perfectly, leaving them hot, tender and moist. It is a rich dish, but not overly rich; I could have easily eaten the entire order myself. There were four mussels, but I forgot to snap a picture until we had each eaten one. 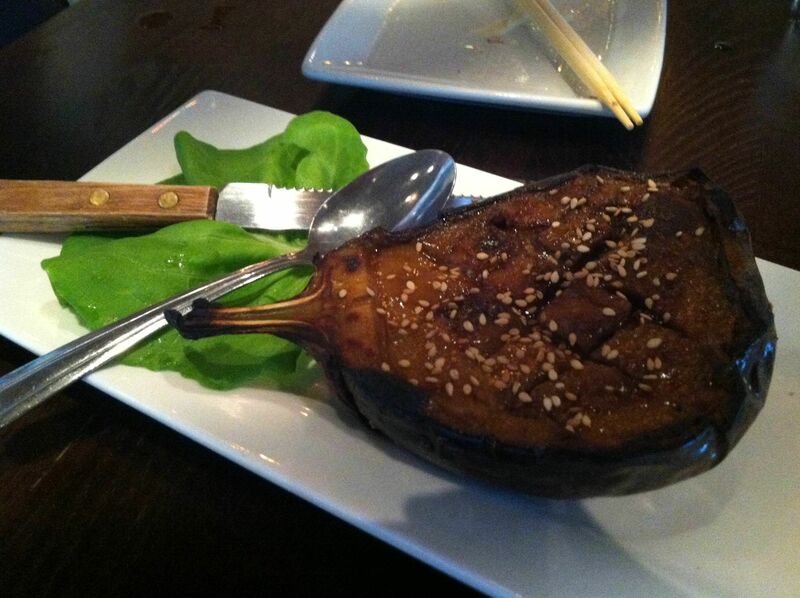 Next we had the Nasu Miso Eggplant, which is half a small eggplant topped with sweet miso and broiled. Even if you don’t care for eggplant, you may enjoy this dish. It does not have any of the bitterness that can be present in eggplant. It is slightly sweet from the miso, with a little crunch from sesame seeds sprinkled on top. Yum! 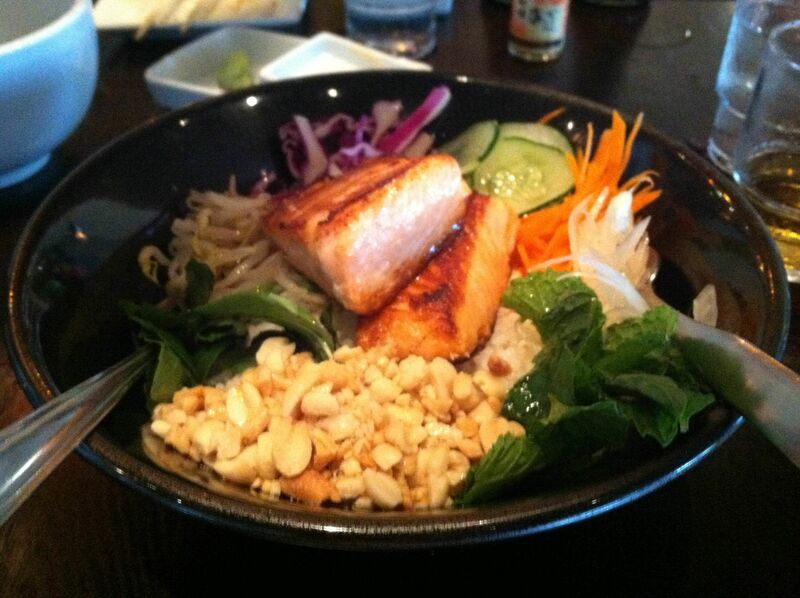 Our next dish was another favorite of ours called Nuka Bowl with Shio Koji Salmon. At the bottom of the bowl is the most exquisite tasting rice, freshly milled in house. It is a mouthwatering dish. The rice is artfully topped with bean sprouts, thin cucumber slices, purple cabbage, shredded carrot, basil, fresh mint, crushed peanuts and sprinkled with a delicate sesame lime dressing. The Nuka Bowl is a work of art and scrumptious. Our salmon was meltingly tender. 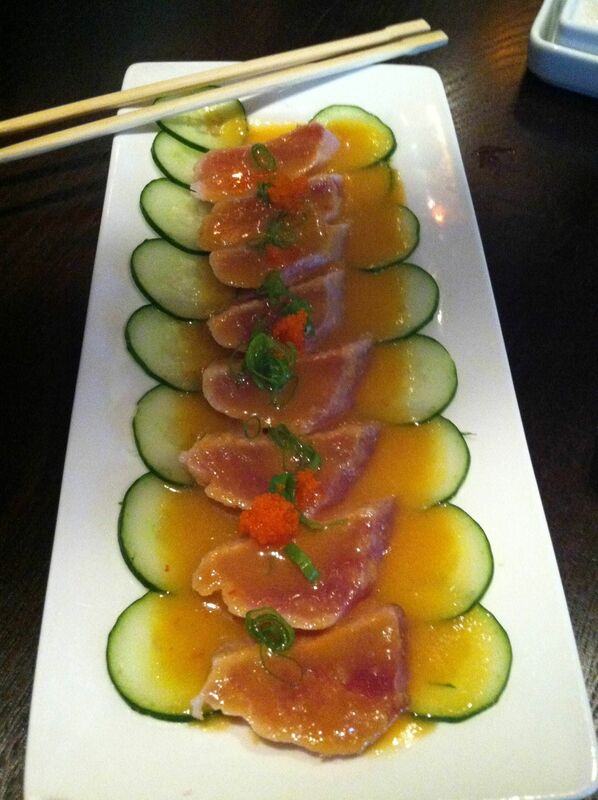 The Ahi Tataki was not only stunning to look at, but delicious as well. The ahi was seared and sliced and then dressed with sesame oil and ponzu. Nope, we aren’t done yet! We have never had French fries in a Japanese restaurant, and this is the first time we tried them at Nuka. Very tasty indeed. These are Asian French Fries with furikake and wasabi aioli. 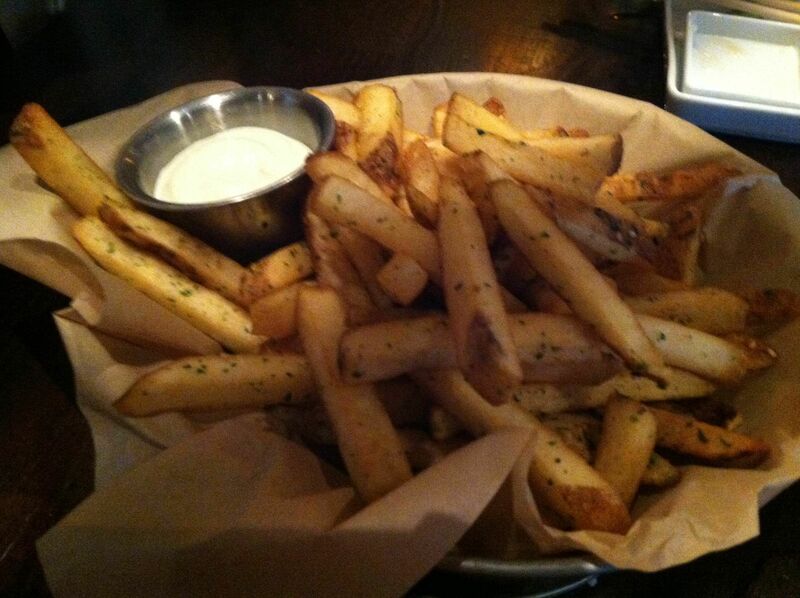 Like all the best fries these fries were light, crispy and tasty with a dip in the aioli. And. . . last, but not least. . . DESSERT! Whether you live on Maui or are a visitor, I hope you will stop by Nuka. It is a fabulous dining experience that you will appreciate, if you enjoy great food, excellent service and a beautiful setting. The prices are reasonable too! If you don’t want to wait, you should get there early; they open at 4:30 and can be full by 6:00, with a line out the door. Don’t say I didn’t warn you! 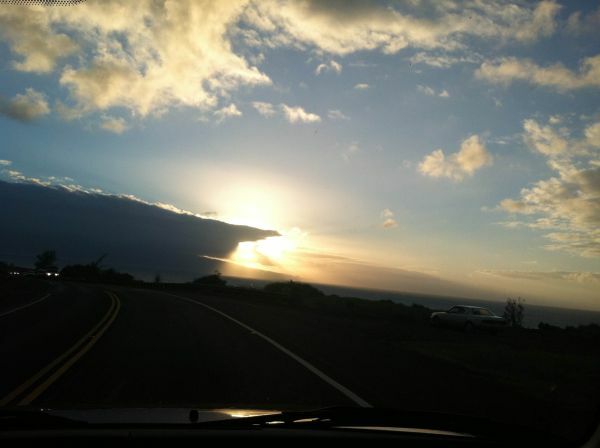 This is the view from the car going from Haiku to Paia. Gorgeous! 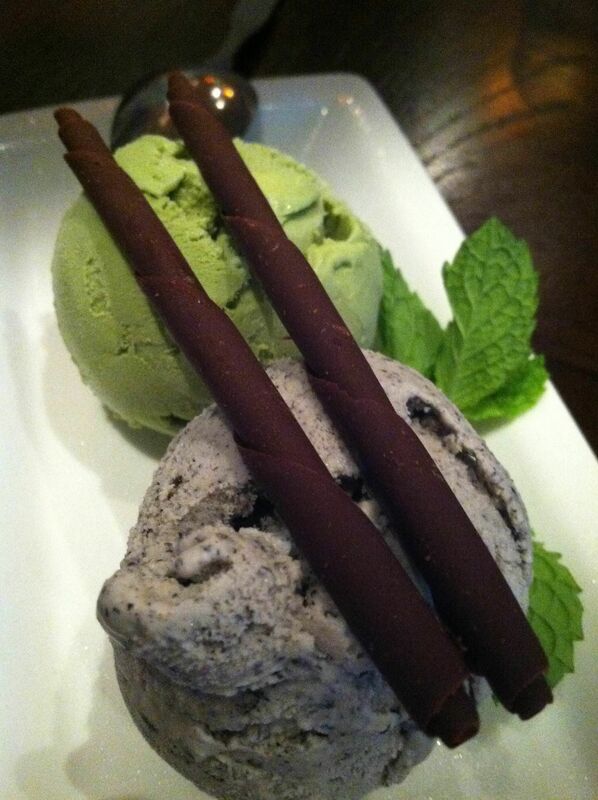 Categories: Uncategorized | Tags: dining out, dining out in Hawaii, dining out in Maui, Haiku Maui, maui, Maui Japanese restaurants, Maui restaurants, Nuka Japanese Restaurant, Nuka Restaurant, restaurants, things to do on Maui, visiting Hawaii, visiting Maui, where to eat in Haiku, where to eat on Maui | Permalink.